Oliver Kern was born in 1970 in Schwäbisch Gmünd, Germany, where he began studying piano at the age of 5. His artistic activity started when he was very young, and he stood out in the German musical scene for his brilliant achievements in international piano competitions. He graduated with a first-class degree in piano, orchestral conducting and choral conducting from the Staatliche Hochschule für Musik in Stuttgart, under the guidance of Wan Ing Ong. He then went on to specialize in piano with Rudolf Buchbinder and Karl-Heinz Kämmerling, at the Musik-Akademie in Basel and at the Mozarteum in Salzburg. 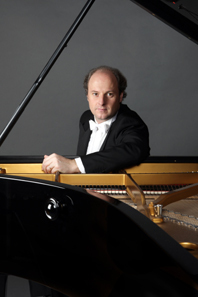 Throughout his career, he has won a considerable number of awards in international piano competitions, including first and second prizes in the international competitions of Senigallia, Hamamatsu, Peking and Paris. He has attracted attention and positive reviews from critics by winning two prestigious competitions: the “ARD” award (prize) in Munich, in 1999, and the “Beethoven” award (prize) in Vienna, in 2001, having been the first German pianist to have won this award; in the latter he also received the special award for the best performance of Beethoven’s sonatas. He is much appreciated for his performance of Beethoven’s and Brahms’ music – critics have recognised his noteworthy possession of technical virtuosity that is not an end in itself, but rather oriented toward a thorough research into timbre and expression. His profound interpretation has led him to the realisation of seldom undertaken cultural projects such as the performance of Brahms’ complete works for piano solo in the Classix Festival Braunschweig: “With great intensity and poetry Oliver Kern is modelling the Brahms cycle.” (Braunschweiger Zeitung). He has performed in important festivals and in famous halls throughout America, Asia and Europe, and has been acclaimed by audiences at esteemed concert venues such as: Musikverein and Konzerthaus Wien, Schauspielhaus Berlin, Musikhalle Hamburg, Herkulessaal Munich, Salle Gaveau Paris, Teatro alla Scala Milan, Auditorium St. Cecilia Rome, Century Hall Beijing , Saitama Arts Centre Tokyo, and the Seoul Arts Center. He has played with famous orchestras including the New Japan Philharmonic Orchestra, the Seoul Symphony Orchestra, the China National Symphony Orchestra, the Radio Symphony Orchestras of Berlin, Munich, Hannover and Vienna, and worked with eminent conductors such as Dennis Russell Davies, Michael Stern, Lu Jia, Marc Soustrot, Gerard Oskamp and Dmitri Yablonski. He has recorded for the German, Austrian, French, Italian and Japanese radio and television, and has published CDs of solo piano works by Beethoven, Brahms, Chopin, Ravel, Schubert, Schumann, Scriabin and Stravinsky on the “Realsound” label.